NOTE: YOU CAN'T HAVE BOTH! Choose either the Aspiration Reward OR the buyable version. The buyable version is attached to this post, in the archive "Hibernator_main_(BUYABLE).rar". Install it as usual (the QX works fine, too). Once installed it, the buyable Hibernator can be found in the normal Buy Mode catalog, in the section Misc/Misc, at a price of §15,500 (sorry, but you have to earn it anyway! ). 08 NOV 2006: Also ADDED a new "Glass" recolour made by CyberBob: it's more transparent then mine, and has a transparent base, too (not only the door). 11 SEPT 2006: FIXED the bug that caused the children to sit on the floor after exiting the Hibernator; also improved compatibility with other hacks involving beds by removing the categorizaton of the Hibernator as "bed". Thanks to TwoJeffs for both bug-fixes. 27 DEC 2005: FIXED the "jump" bug that occurred when cancelling the "Hibernate" interaction while the sim was still walking toward the Hibernator. You want to have 10 children and an entire life isn't enough? You want to meet your grand-grand-grand-nephew? Just take a "nap" into the Numenorean Hibernation Cell! I'm very proud of this object (though it isn't perfect ), because it's definitely the project that I worked on for the longest time. I've made a completely new animated mesh (created from scratch), heavily modified the BHAVs, edited and adjusted the animations, enabled the colour options... A special thanks to Inge Jones for having pointed me in the right direction with the BHAV that saves/restores the age of the sim. 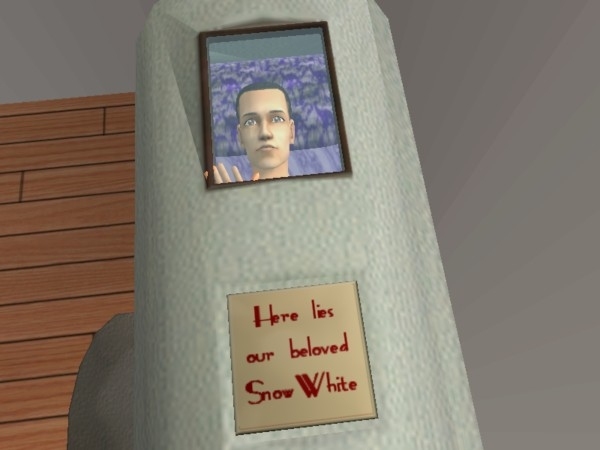 The Hibernator functions: you can send your sims to hibernate for a chosen time (from 1 day to 1 month); the sim will enter the hibernator (obviously naked: have you ever been hibernated with your clothes on? ) and will stay there in life suspension: no aging, no needs, nothing! If you don't manually interrupt the hibernation, by deleting the action from the command queue, the sim will automatically "wake up" when the chosen time has finished. 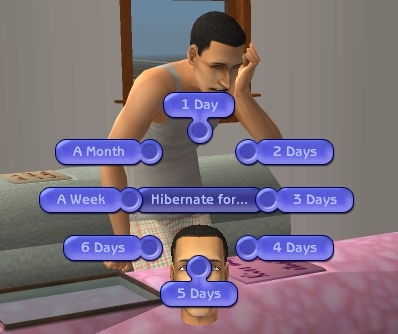 The hibernator takes care of all the body's needs (all the stats will slowly increase during the hibernation); only drawback: the sims will feel lonely into the hibernation cell, and their "social" will slowly decrease; the more they stay in, the more they will need social interactions when they wake up. I suggest to put the Hibernators in a quiet place: though hibernated, the sims don't like noise, music and such (a "thought balloon" will be displayed if a sound disturb them). Installation: put the package(s) in the downloads folder. You will find the Hibernator among the Aspiration Rewards, not in the normal catalog! The objects that I've cloned, in order to create the Hibernator, were the cheap single bed and the coffin, though very little still remains of both of them. The Hibernator works in every game, even without EPs, is recolourable, and is shipped in three colours: blue (default), pink and transparent glass. The mesh is only 822 faces / 584 verts (= very low, for an object of these dimensions). If you are going to create recolours for the "metal" cover, be sure to recolour the separate "plaque" texture". 1) When the Hibernator is used by a child, the animation of the door isn't perfectly synchronized with the body movement, and the child's body sometimes peeks out of the door (this happens only when entering and exiting: the hibernation itself has no glitches). 3) FIXED (Was: If you order a sim to hibernate and cancel the action before he reached the hibernator, an error occurs (the sim will "jump"); there's nothing to worry about, though).